#522 - How do YOU eat your delicious beans? Submitted by Mitchellfrom Aus on July 11, 2011 - 3:27am. Submitted by MitchellfromUSA on July 11, 2011 - 2:52pm. Submitted by Mitchellfrom Aus on July 12, 2011 - 2:46am. Submitted by Mitchellfrom Aus on July 12, 2011 - 2:51am. Also, there is 1 costco store in Australia and its on the other side of the country. Submitted by SomeKiwiGuy on September 12, 2013 - 1:27am. Unfortunately there appear to be Zero total Costco stores in NZ. I want mah huge bag of Jelly bellies.. Submitted by Suilean Dubh on July 11, 2011 - 6:11am. Jelly beans always had a weird texture to me... Like blueberries. 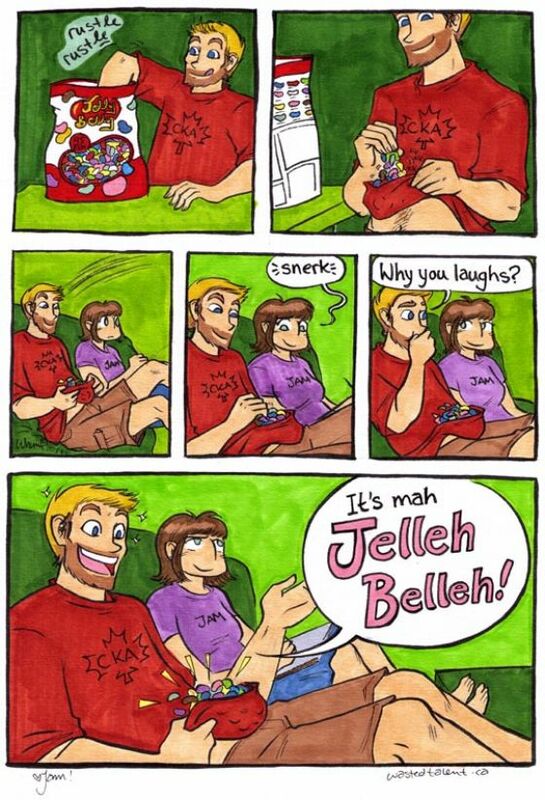 I approve of the "Jelleh Belleh" though. Creative food techniques FTW! Submitted by greg on July 11, 2011 - 6:45am. Submitted by Lookatme on July 11, 2011 - 9:25am. at least they aren't butterfingers. those things are just fried peanut butter covered in chocolate, they are horribly delicious. also better not send him during holloween sales, the bags get bigger. Submitted by peterntrinh on July 11, 2011 - 9:59am. Submitted by saigan on July 12, 2011 - 11:32pm. Well it does save on washing up.. Submitted by GIRakaCHEEZER on July 13, 2011 - 1:43am. Costco is a great place to buy candy in bulk. That's one of the few things I like in bulk, really. Also I'm not sure if this is the place where I should be posting this, but your forums seem a bit overrun with spambots. Submitted by matrixviking on July 13, 2011 - 9:34am. I'm not sure Vancouver *has* a Costco...does it? Hope you're feeling better, Jam! And yeah, $6 for soup is too much, even in Canada! Submitted by 4ndy on July 14, 2011 - 7:05pm. I wish we could get those snazzy iron rings here, but just had to settle for a pat on the head and some silly latin hymns. Submitted by Ronald Riehn on July 17, 2011 - 5:51pm. When I was still up at Ft. Drum, NY my wife and I looked up the closest Ikea and the closest Costco at one point. Both were in Canada, and the next closest was a four-hour drive away near Alberta or five hour for NYC. Submitted by Robert C. Trudeau on July 27, 2011 - 12:18pm. Omg, I love Jelly Bellies! That's a great idea he's got there, Trevor is brilliant! Also, Jam's face in the last panel is so adorable, haha. This is now my third comic involving gigantic bags or boxes of terrible candy......... clearly there is a problem here.